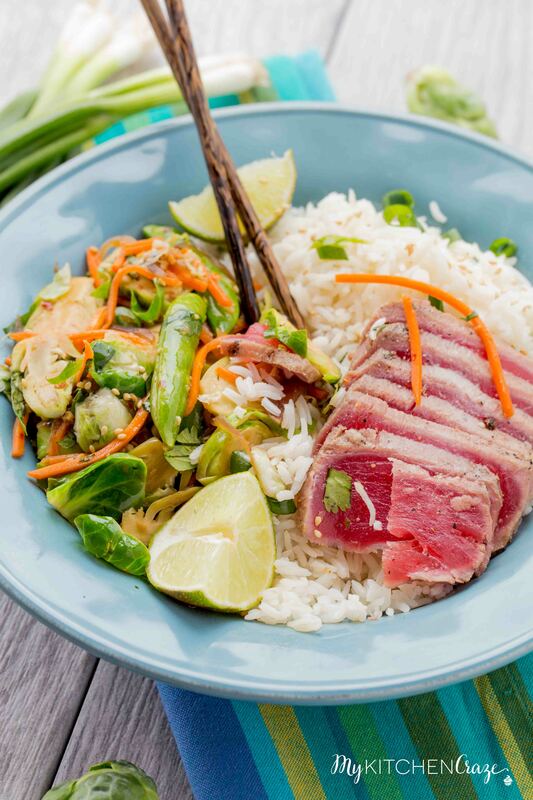 Ahi Tuna Rice Bowls are perfect for those busy hectic nights where you don’t want to cook, but need something healthy on your dinning room table. 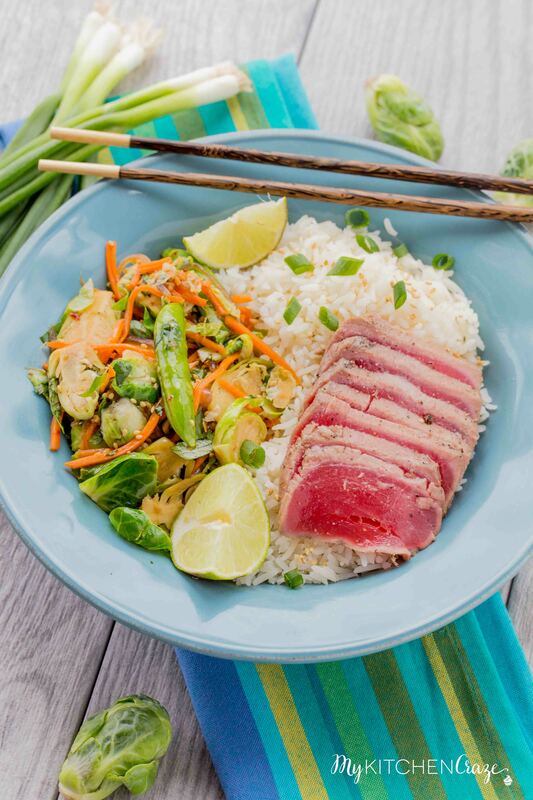 Seared Ahi Tuna joined with white rice and sautéed vegetables, this is one meal you won’t want to pass up. I was never a seafood person growing up. I just didn’t like the smell or texture. I knew I was missing out because I would see people eating these fun and cool seafood dishes. I remember thinking to myself that I wished I liked seafood and could eat it like others. Fast forward 15 years and guess what?! Yep you guessed right…I like seafood now. YAY! It was more of a gradual process, but I can now say that I’ll try almost any type of seafood. I’m still kinda of wary of oysters and mussels, but anything else and I’ll give it a go. I was lucky enough to have the opportunity to try this amazingly delicious Bumble Bee SuperFresh® Seared Ahi Tuna. You guys I can not tell you how good this Bumble Bee SuperFresh® Seared Ahi Tuna is. It’s fresh and good quality. 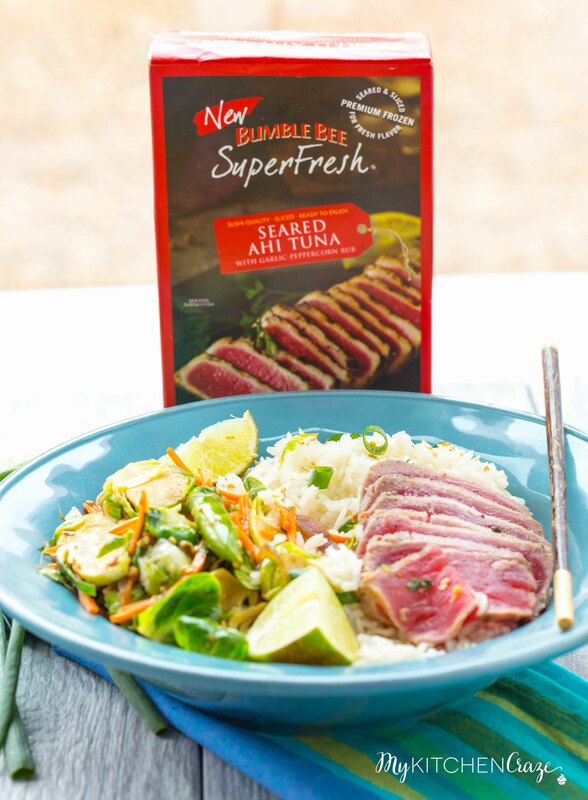 When I first tried the Bumble Bee SuperFresh® Seared Ahi Tuna I felt like I just ordered an expensive seafood dish. It was seriously so delicious. One of my big hang ups with seafood was the smell. I just couldn’t deal with it. But now that I eat seafood I’ve come to realize what good fish smells like vs. not so good fish. Let me tell you that this Bumble Bee SuperFresh® smells and tastes amazing! No fishy smells here and because you prepare Bumble Bee SuperFresh® straight from the freezer, there isn’t any smell associated with thawing fish. Their frozen protein has stayed that way from harvest to your oven unlike most of the “fresh” fish you find at the seafood counter. That means its fresh tasting, and fresh smelling. 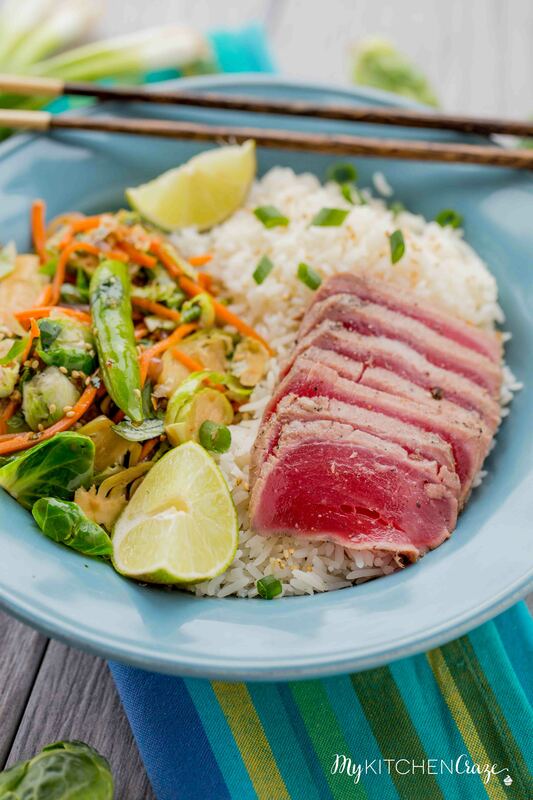 I knew when I received this Bumble Bee SuperFresh® Seared Ahi Tuna I had to make a rice bowl. You see my hubby, Sean is the biggest seafood and rice fan. He could eat it every day and never tire of them. I wanted to surprise him with this Ahi Tuna Rice Bowl because it was something I’ve never made before and I knew he would love it. I’ve made a similar recipe before with some shrimp, but we’ve never had Ahi Tuna before. To tell you he was excited is an understatement. He was on could 9. He ate not only one bowl, but two. The whole family loved these rice bowls, which in my family is a great accomplishment. It’s a rare day when all four of us like a recipe, but the kids kept asking for seconds. To bad Sean ate all the leftovers, ha! Another plus about this Bumble Bee SuperFresh® Seared Ahi Tuna that Sean liked, is it’s a delicious treat with a side of soy sauce and wasabi. Instead of a heavy snack, you can have Bumble Bee SuperFresh® Seared Ahi Tuna as a snack. Make sure to check out Bumble Bee SuperFresh® full line of products. 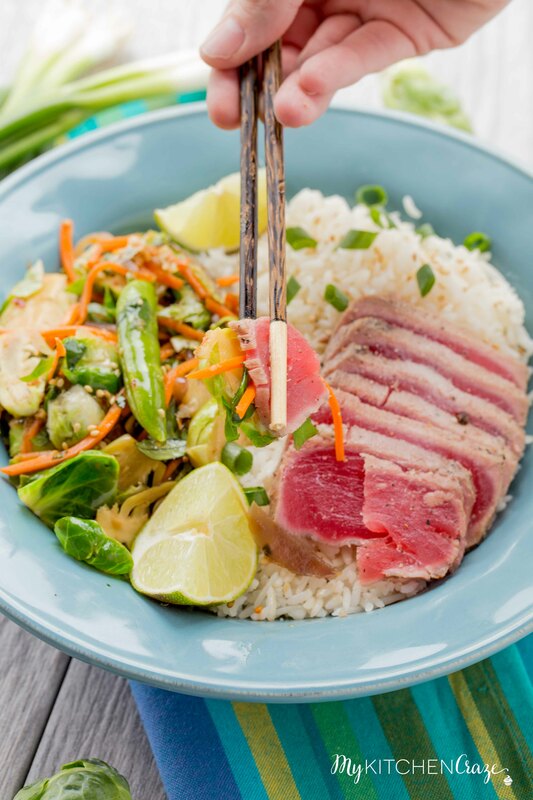 I hope the next time you’re craving some good quality delicious season you try these Ahi Tuna Rice Bowls. I promise you’re going to love how easy and delicious these bowls are. Enjoy! Be sure to check out the store locator to find Bumble Bee SuperFresh® products near you. You can find Bumble Bee SuperFresh® in the frozen seafood section, typically near the seafood counter, at your local grocery store. Heat water over medium-high heat in a sauce pan. Once boiling, add rice. Bring to a boil, then cover and reduce heat to a simmer. Cook without removing the lid for 17 minutes. Remove from heat and let sit for 5 more minutes. 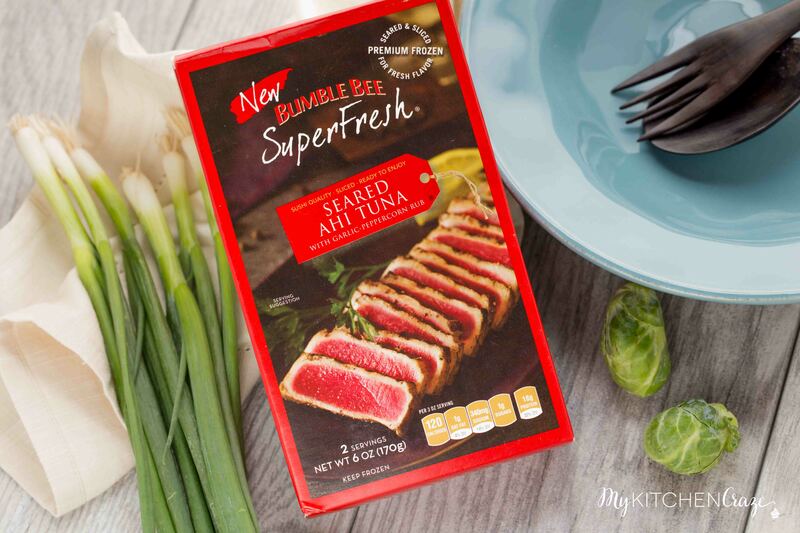 Prepare Bumble Bee SuperFresh® Seared Ahi Tuna according to package directions. 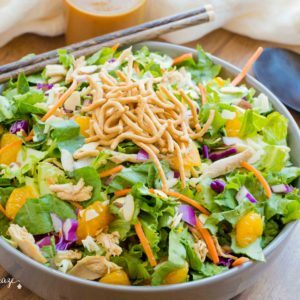 Using a medium size skillet, add sesame oil and heat to a medium-high heat. Add onion and garlic; cook and stir for 1 minute. Add brussels sprouts, ginger and red pepper flakes; cook for another minute. Add broth and soy sauce; cook for 2 minutes. Add vegetable mixture to a medium size bowl. Stir in carrots and snap peas. Stir to combine all vegetables. 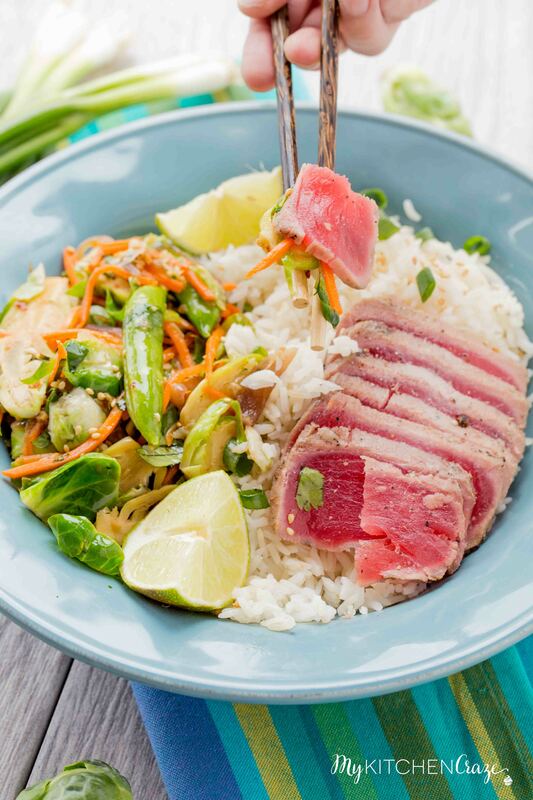 Prepare the bowl by adding some rice, then the vegetable mixture and finally topping with Bumble Bee SuperFresh® Seared Ahi Tuna. Garnish with sesame seeds, green onions, soy sauce and red chili sauce for heat. I could eat seafood for pretty much every meal, especially if it’s the Bumble Bee kind! These ahi tuna bowls look fantastic, Cyndi! I love how easy this comes together. 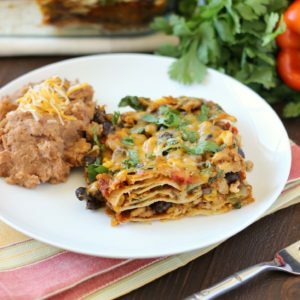 So perfect for busy weeknights! Clear the house I am going to eat all of this without sharing!! That looks like a restaurant-quality meal! Wow! I know a couple of people who would love me to serve this for dinner! I adore seafood – and this looks amazing. I have NEVER seen this product before, I have to find some! I’m a sucker for a good rice bowl!! I’m LOVING that seared tuna! What an amazing meal! I had no idea that they sold seared ahi tuna! I’m going to definitely keep a look out for it now though because these bowls look insanely delicious, Cyndi!